Don't want to drive your car to the forest, this property is located close to the heart of the famous Redwood forest and is five minutes easy walking from your doorstep to the start of Long Mile Road. If your into biking you can easily cruise off from here and be on the tracks riding in no time at all. If you prefer the lakes, we are just off Tarawera Road, which is the main road out to the beautiful Blue and Green Lakes. Our house is equiped with everything you could need on your holiday here in town. 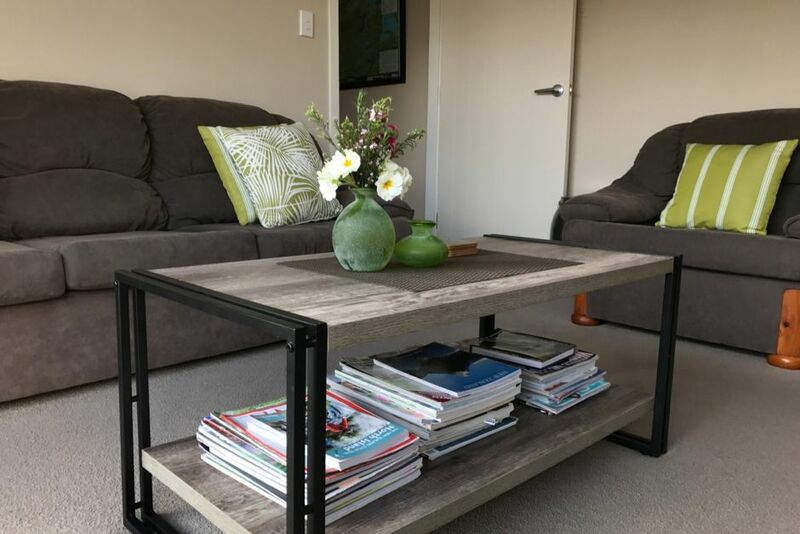 Only 5minutes drive from the CBD and 4km from Rotorua Airport. Rotorua has many unique tourist attractions whether you are a family on holiday, a couple or a group out for recreation and fun. Motion Entertainment located closeby at Lynmore Junction - Chipmunks Playland, Dialled Indoor Tramp Park, XD Dark Ride, Escape Masters, Lumberjax Mini Golf, Megazone Laser Tag, Strike Zone Tenpin Bowling, and Timezone. Food outlets, dine in and takeaway including Giovanni's Italian Restaurant and Pizzeria Kebab Kitchen and House of Spice. Large shed available to lock away property. Close proximity to the new Redwood shopping centre, cafe, medical centre and local food outlets like Burger Fuel, Kebabs, Dominos, Subway, Fish and Chips, Chinese, Indian. As well as minutes to town and local attractions like Te Puia Maori Experience. PLEASE NOTE WHEN BOOKING TO ADVISE THE AGES OF ALL CHILDREN UNDER 18 SO WE CAN MAKE ANY ADJUSTMENTS TO THE ADDITIONAL PEOPLE AS THE SITE WILL AUTOMATICALLY ALLOCATE EACH ADDITIONAL PERSON AS AN ADULT. You are more than welcome to use the items in the pantry, we also encourage you to leave any unwanted sauces or food items that may be of use to future guests, rather than dispose of them. I'll be back for sure. Thank you. We were 3 adults and a 2.5 year old....the house worked perfectly for us as a base for exploring the area and having a washer/dryer was a real bonus when you are travelling with a minimum of clothing. Toys/books were a real bonus for the toddler. Thank you. We loved our stay and would recommend this place to all. Beautiful, clean, family & pet friendly home. Secure section and very close to all amenities. The property is easy to find and rooms are all generously sized. Highly recommend and would definitely stay again! Thank you again Fiona.